A Special Treat for You: The Jackie-of-the-Month Collection! Ever wonder what happens to all those great portraits of Jackie that appear each month on the home page of the Kids Corner? Well, the webmaster decided to gather them all together for your viewing pleasure. Click the link below to go to the gallery! Yes, kids - the webmaster is on vacation again. There's half a foot of snow blanketing the ground and the weather outside is frightful. So she sits in her cozy room, wrapped in her cozy pony-print fleece cover and comes up with crazy and fun things for your enjoyment. 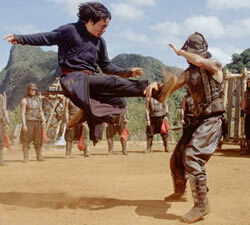 Click here to see the latest Jackie Chan Movie That Wasn't! New Photos of Buddy Bears in Istanbul! 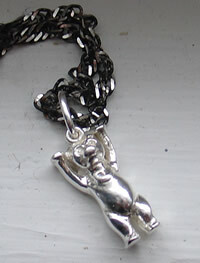 This little silver Buddy Bear necklace was sent from Eva Herlitz, the creator of the Buddy Bears! It is very detailed and quite beautiful. Thanks so much Eva! I want to thank everyone who sent me Christmas greetings this year. Wow! I was so touched that you took the time to think of the old webmeister during the holidays. I not only received cards, but a few gifts as well. I really appreciate your thoughtfulness and certainly I hope that you will continue to enjoy the Kids Corner as we approach our Third Anniversary!! Happy Holidays to everyone. 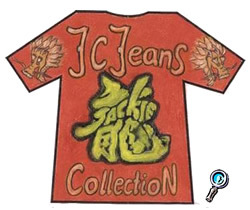 VOTE FOR YOUR FAVORITE "DESIGN A JC JEANS T-SHIRT"
New Jackie Chan "Movie That Wasn't"
Color a Buddy Bear and send it to the Kids Corner. You never know when YOUR design will be included in one of the Buddy Bear collection books that are sent to Jackie! Create a new Jackie Chan Movie That Wasn't. Write a story, draw a picture, create a collage, write a poem, or design whatever your heart desires and we'll add it to the SHARING CORNER. 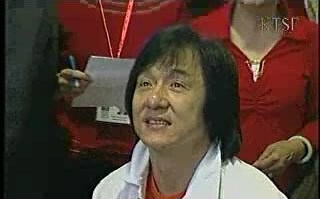 Create a Jackie Chan work of art for the Kids Corner Jackie Chan Art Gallery. Add to Jackie's Coloring Book by choosing a coloring project to complete. Make a tile for Jackie's Tile Project and send it to Hong Kong. Chances are you'll receive back a photo of Jackie holding your project (and just MAYBE an autograph as well). Another Look at "Around the World in 80 Days"
The Kids Corner webmaster had a chance to take another peek at the movie and would like to share her thoughts with you. Click here to read all about it! This video is from Jackie's appearance in San Francisco last year. Click here to see Kids Corner friend Jeff Applebaum's photos from the same day. The Kids Corner webmaster has a problem. She would like to contact Helen from Australia (mother of Katie and Sarah), but does not have her e-mail address. If Helen reads this, please send the webmaster an email!!!!!!! Thanks. Hollywood movie star Jackie Chan pushing his father Chan Zhi Peng out of the arrival hall at the KL International Airport when they arrived last weekend. Malaysia's Star-Online newspaper ran a really nice article about Jackie and his dad. Click here to read the whole article. 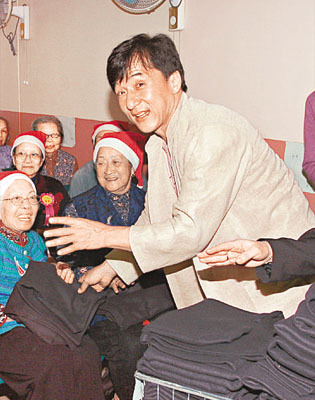 Here's Jackie handing out some of the 1,000 woolen sweaters he donated to a Senior Center. Photo: The Sun. 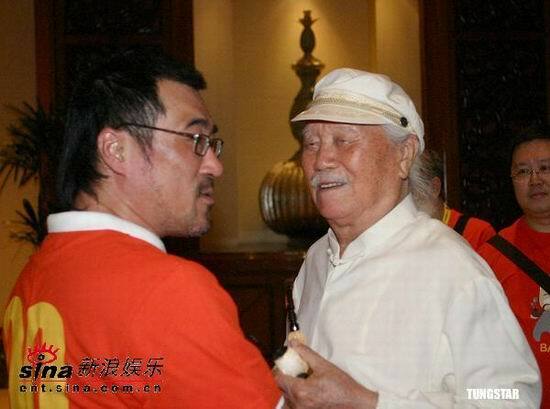 Here are a few photos from Papa Chan's 90th birthday party. You can see a cartoon of Papa Chan on the t-shirts along with the word "Baba" which means "papa" (dad, father, etc.) in Chinese. 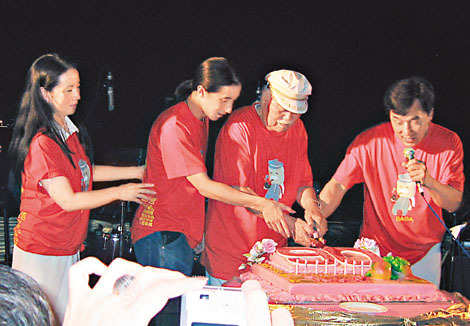 Papa Chan cuts his cake while surrounded by his family. Left to right: Lin Feng-Jiao, Jaycee Chan, Papa, and Jackie. Click Santa to see the newest cards! 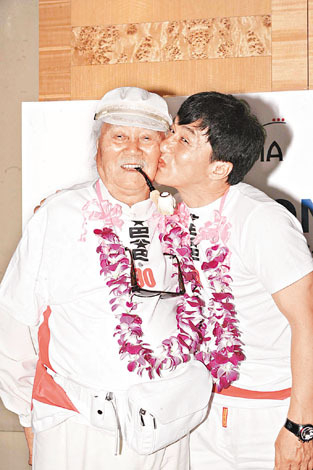 Hong Kong superstar Jackie Chan arrived in Kuala Lumpur yesterday to throw a big birthday bash last night for his father, Charles Chan, who turns 90. Chan took 140 rooms at the Palace of the Golden Horses, including its most expensive suite. The Golden Suite costs RM12,000 a night. The dinner party was held at the Mines Resort Golf Club. Chan and his father arrived at the Kuala Lumpur International Airport on a special charter flight from Hong Kong, which reportedly cost HK$1 million (RM490,000), with at least 100 guests in tow. 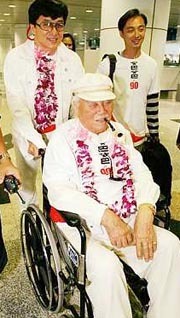 All were wearing T-shirts emblazoned with the words Papa@90. The Chan entourage leaves for home today. According to Chinese news reports, Jackie and the production team of The Myth are traveling extensively through China to film various parts of the movie. Unfortunately, accidents continue to plague this production - another actor has suffered an injury on the set. It seems as though working with horses isn't as easy as it looks! More Christmas Cards for Jackie! 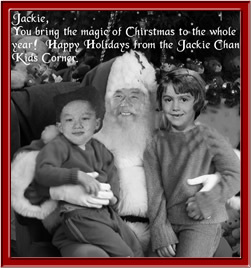 Just when the Kids Corner webmaster had nearly given up hope that fans would send in the kinds of wonderful Christmas cards that they have in past years, she went to check the Kids Corner mailbox and it was STUFFED full of cards for Jackie. Thanks so much! Click below to see the newest additions to the cards. There will be more cards posted either tonight or tomorrow since another package of cards has just arrived from fans in Wisconsin! Wow! Thank you so much to all of you who have sent me a beautiful Christmas card. I was touched by all the nice things you had to say about the website - I'm so glad you enjoy it. I hope that you will continue to have fun visiting the Jackie Chan Kids Corner as it keeps growing and getting better and better. Merry Christmas and Happy Holidays to everyone. After arriving in Nuernberg, Germany today from Beijing, Jackie appeared on a popular German interview show. He talked a little bit about Around the World in 80 Days and he mentioned again that he would like to do more acting that action in the future. He also mentioned the accident on the set of The Myth and talked about his work with the United Nations Children's Fund. Jackie was in fine physical shape (he mentioned being tired from the travel), so it looks like he's fully recovered from his injuries on The Myth set. Click the photos below to see the interview (it's in English) OR a great spot where Jackie breaks bricks while holding a raw egg in his hand! Now you can search the entire Kids Corner by keyword! It's only a click away. Try it out and see what you think. There's still plenty of time to send a Christmas card for Jackie (even from overseas). Thanks to everyone who has sent one so far, but it sure would be nice if we had some more! We don't want Jackie to be sad when he opens his packet of cards from the Kids Corner fans, do we? Click here for more information. Remember, there are some great prizes to be won! The United Circle of Buddy Bears is now on view in Istanbul. It will be there until January 5, 2005 if you would like to stop by and have a look. Click here to read about the new exhibit and see some photos. A couple of pretty and creative cards came in today to the Kids Corner mailbox. Check them out here. Time is running out to send in cards - there are only a few weeks left. If you need some inspiration, click to see last year's cards from Kids or Adults! And don't forget to check out the Christmas Buddy Bears! Jackie Injured While Filming "The Myth"
While filming a scene on the Jingxi Prairie in Beijing last Saturday, Jackie injured his back and had to be carried off the set. Click here to read all about it. The Kids Corner wishes Jackie a speedy recovery. Buddy Bears, Buddy Bears, Buddy Bears!! 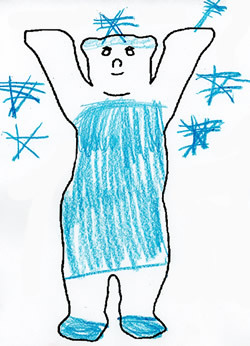 Click 8 year-old Grace's "Ice Fairy Buddy" to see all the new bears! As some of you might know, the Kids Corner webmaster teaches third grade when she is not working on this website. Recently, her students presented her with a whole pack of Christmas-themed Buddy Bears! 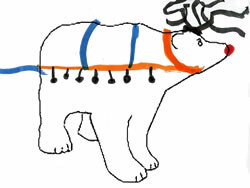 Click Clare's Reindeer Buddy to see them all. Christmas Cards For Jackie Begin Arriving! 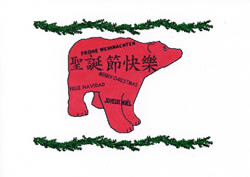 Thanks to Kerstin from Germany for being the first one to send in a Christmas Card for Jackie. It's a very clever card using the Buddy Bears that we all know Jackie loves. 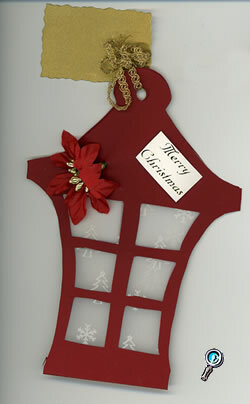 Click on Kerstin's card to see the first of the cards for the 2004 contest! Thank you so much to those of you who have sent me Christmas greetings. What beautiful cards! I really appreciate all the nice things you say in your cards too. I love being the Kids Corner webmaster and I'm so happy that you like the job I'm doing. Thanks to Carol, Kerstin, and Haarsha, Ayushi, and Yash for the lovely Christmas cards. Click on the newsletter above. If you would like to read the Kids Corner webmaster's comments on New Police Story, click here. Please be warned that there are spoilers in the review, so if you haven't seen the movie you might not want to click just yet. New Police Story Takes Four Awards! So it looks like New Police Story was THE favorite movie this year! Congratulations to JCE, to Jackie, to Willie, Solon, and Barbie, to Benny Chan, and everyone else who worked on this fine film! Jackie's newest Hong Kong movie, New Police Story, is finally available for viewers outside of Asia to see - it has been released on DVD and can be purchased online from various sources. This movie shows a side of Jackie that most have never seen before. It is an intensely emotional movie that is, at times, almost painful to watch. And that says a LOT about Jackie's superior acting ability. New Police Story is not a movie for Jackie's younger fans. It is too intense. But since this website has many adult Jackie fans who visit, the webmaster will be posting a review here within the next few days, so stay tuned. Time's up for sending in a design for the T-shirt contest. However, a few entries arrived at the last minute and have been added to the pages. Click the beautiful shirt, below, to see them all! Voting will come soon. Stay tuned.